Living on a sailboat and getting work done was a pleasant surprise in the Caribbean. Not only was the workmanship great, the prices were also very cheap. How cheap...about half of what you would pay in the US. Teak in Trinidad was very cheap...they grow it there...caution make sure the wood is seasoned, it is very green when first cut. Living on a sailboat and getting work done at haulout...why haulout? We hauled our boat out each May and spent the summers in the US. We had no desire to be on our boat in the water during hurricane season. If you must be in the boat I would hunker down at TTYC, the Trinidad and Tobago Yacht Club. Why? Trinidad is just off South America and is less than 11 degrees north. It is hard to get boat insurance to cover a named storm damage if your boat is any further north than 12 degrees...Prickly Bay in Grenada is right on the cusp. 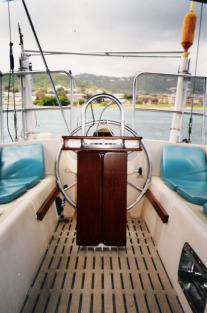 We hauled out at Peakes in Chaguaramas, Trinidad for 4 summers. Why? 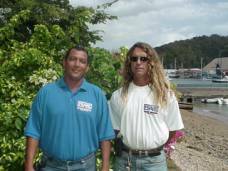 This is Michael (The Robert Plant lookalike), the best Travel Lift man in the Caribbean. He has been at Peake's for at least 15 years...maybe longer. I never worried about my boat being left at Peakes. Good security and I knew Michael would make sure the boat would be properly chocked. He got all the beer on board when we left. They move a slew of boats every day...that's why they are so good. Because it was cheap, every year, we had the bottom cleaned, faired, and painted with Sea Hawk bottom paint. You cannot get this in the states...it is great bottom paint and the bottom paint crews are good. We were very pleased with the extensive interior work we had done in Trinidad. While in Trinidad we took advantage of local craftsmen and had our vberth mattress replaced . They cut several layers of foam and bond them together. The result was a super sleeping environment. Check out all the interior cushions...all recovered in Trinidad. The faux leather wore very well...we got lots of compliments. The pattern for the wedge and roll...if anyone recognizes it we would love to get some more. We saw it at the Moorings in Tortola, we would like to get more...any ideas? A real plus for being in Trinidad was the fact that teak is grown on the island. You must be careful and hope the teak is properly cured...if it is get out the wish list. Here is shot of the teak cockpit grate we had made in Trinidad. Very salty. Note the fold down table attached to the binnacle. When it was just the 2 of us we ate all meals on this table. 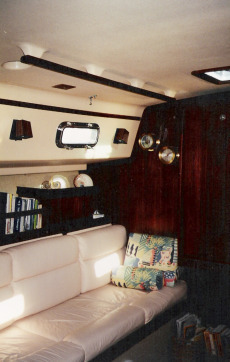 The big boat improvement was our teak floor below deck. What comes from the factory is a thin veener of teak. We had a real, solid 3/4 inch teak and holly floor installed for $1,000 US. That's a bargain folks. If you are so lucky to be there now or are going to the Caribbean soon, take advantage of the craftsmen and prices especially in Trinidad. Living on a sailboat and getting work done is easy and cheap. Your boat will never look better. Enjoy.